Disney EMEA today announced that it has commissioned award-winning independent European UK production company, Factory to produce a brand new festive original programme, We Wish You a Merry Walrus, inspired by the #1 virtual world for kids and BAFTA-nominated, Disney Club Penguin. Set to be the perfect pre-Christmas treat for Club Penguin fans around the world, the special will air on Disney Channel UK at 6.30pm on 17th December 2014. 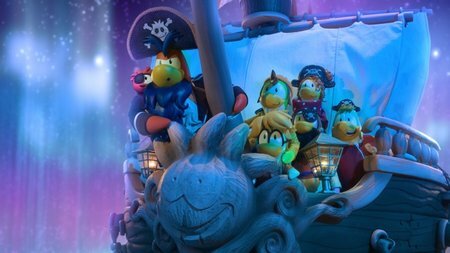 Set on Merry Walrus Eve, the story follows a seafaring penguin named Roofhowse who arrives at Club Penguin Island only to find himself wrapped up in an unexpected festive adventure! Following a magical Blue Crystal Puffle, Roofhowse and his new friends journey to the fabled Merry Walrus Island and learn that they must band together to stop their favourite holiday celebration from being silenced forever. The Altrincham-based production company, which is responsible for producing some of Britain’s best-loved children’s programming content including Strange Hill High and a brand new series of The Clangers, is behind the 22-minute show. The director is Tobias Fouracre (Frankenweenie, Corpse Bride, Fantastic Mr Fox and The Koala Brothers), creative producer is Matt Danner (The Looney Tunes Show, Xiaolin Showdown) and the writers are Martin Olson (Phineas and Ferb) and Christopher Painter (Tom and Jerry Tales). We Wish You a Merry Walrus will be localised in French, German, Spanish, Portuguese, and Dutch. To get Club Penguin fans in the spirit, the online destination will also host a special in-world party, the first ever Merry Walrus celebration, from the 18th – 31st December. Players participate in Merry Walrus’ quirky traditions to celebrate giving. The whole island will become a decorated winter wonderland where players take part in mini-quests to spread festive cheer, which include decorating the tree to festive food fights, and searching for six blue crystal puffle ornaments hidden around the island. Players will be rewarded for their efforts with items and at the end of the final quest, Merry Walrus will appear to present members with their very own blue crystal puffle, which they can keep as a memento after the party ends. Players will also be able to donate their virtual coins to the annual global Coins For Change initiative to help unlock projects funded by a $1 million donation from Club Penguin to charitable causes around the world.